eating:: pumpkin a million ways... pumpkin gnocchi, spicy pumpkin soup, pumpkin pizza... using up every last scrap. I've been working on eating lots more protein and super yummy foods for me. With all the breast feeding going on around here, it's vital that I get lots of the good stuff. There's also lots of apple crumble, broad beans fresh from the pod and green smoothies to use up all the kale in the garden. reading:: Not much, but when I can, I'm catching up on some magazines, flicking through all the recipe books and I'm reading Bedtime Peekaboo five times a day to Tiny Owlet. sewing:: pyjama pants for the bigger owlets. The fabric has been sitting on the shelf for a few years, waiting... tonight I whipped up pants while they were in the bath. Must remember to grab those snippets of time more often. 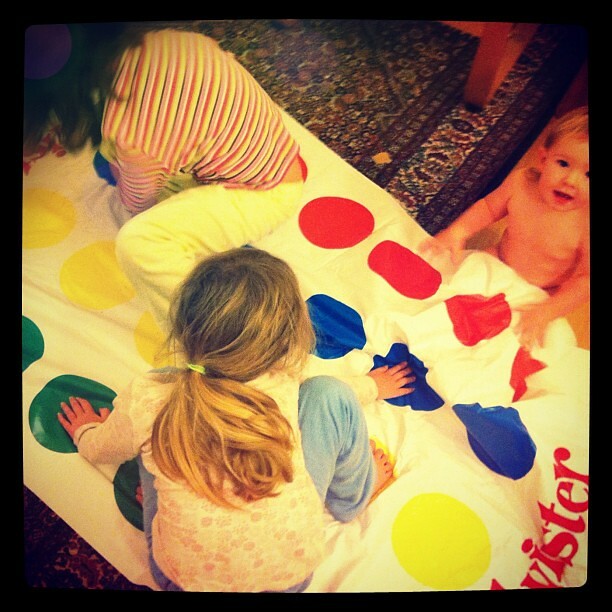 playing:: twister, puzzles, snap, memory, lego, matchbox cars, fuzzy felt... It's been a week for board games and sitting on the floor, hanging 'round, having fun. I've been loving playing everyday with the owlets. It's made for such connected time with them and it has helped me to lighten up tenfold. loving:: my new-ish shoes, walking with the owlets every day... Sundays at the farmer's market and in the kitchen... Spending more time and planning and working with Huz... Chatting with Tiny. Her vocabulary mostly consists of grunts right now, but the words in between and the little signs she uses means we have quite lengthy chats about all sorts of things and I'm loving that. Especially her sense of humor. She adds so much laughter to our nest everyday. Aw every time I read your blog I get all wistful about homeschooling! This week we had a holiday on Monday so the 3 kids and I went to a cafe and then hung out at the park. Was lovely to get that time with my big girl. The end of the week saw a huge play at the park with friends. All in all it was a good week! Much of this sounds so familiar. Especially that little tornado of destruction that follows me too :) Though they are the cutest little destructions I might add. Kitchen cupboards, bookshelves, bathroom cupboards...pretty much everything is being "explored". It can be hard work breastfeeding a toddler, but so worth it I think. Violet is showing no signs of wanting to give up. We too have so much pummpkin right now, so I really need to do a big roast of it for adding to things through the week. The weather has turned here too. But I have to say I love fireplace weather.